Designing value into every machine we build. It stands to reason that in order to build the most efficient, reliable vibratory equipment, conveying equipment and foundry equipment, you need to employ the sharpest mechanical and chemical engineering minds around. 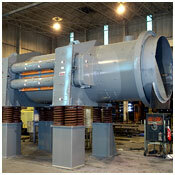 Moreover, custom vibratory processing solutions require creative engineering to solve unique application challenges. In our 60-plus years in the field of vibratory technology, we’ve solved some seriously tough application challenges. Our engineers also understand that the performance of each processing machine will be judged over the long haul: in terms of throughput, reliability, and efficiency. To consistently produce equipment that furthers Carrier’s reputation requires diligence through the quoting, design, and manufacturing stages. Stiff requirements to be sure, which is why our engineers come from highly regarded research universities, are professionally accredited, and possess on average over 15 years of design experience. Talent goes a long way, but equally important are the methodologies we employ. Our engineers use a variety of analytical and testing methods (complete finite element analysis, vibration analysis, energy use calculators, and thermal and heat transfer analysis) to design extreme value into every machine that we build. Let our engineering team solve your material handling problems! 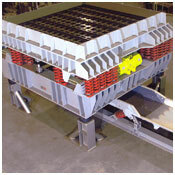 Contact us today with your vibratory, conveying or foundry equipment challenge.